We had a great first day of camp! Cool weather, caring teens and adults, and happy campers! We did our health checks when we arrived, and then met the summer staffers during opening ceremonies. After pack meetings, we headed to the dining hall for chicken nuggets, mashed potatoes, and green beans. 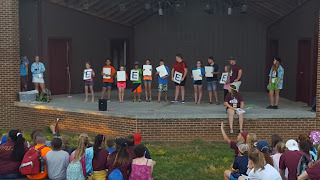 The evening program tonight consisted of swim tests (campers' abilities determine which section of the pool they may swim in) and a game show night, hosted by our four Great Bears: De-Lo, Blueberry, Natalie, and Alison. 4-H Volunteer Aqua created "Island Man", a camp version of hangman, in which campers had to guess letters of words. For each incorrect answer, a Great Bear donned a Hawaiian shirt, then grass skirt, huge sunglasses, a gold bow tie, a green tiara, etc. It was quite the sight as they spelled out words like leadership, great bears, and experience. The campfire was well run by the Great Bears and each pack's Little Bear (a camper chosen this afternoon by his/her peers) was recognized during a vesper. We're now ready to rest up for a fun full day tomorrow.